This is a news release from Mississippi Power. 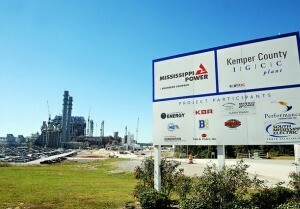 Photo by Mississippi Power – YOU’RE HERE: A sign welcomes truckers to the Kemper Project power plant located north of Meridian in east Mississippi. that would reduce the portion of customer bills related to fuel. Based on the request, a residential customer using 1,000 kWh of electricity per month could see an average savings of $13.70 on their total monthly bill. If approved by the PSC, the lower fuel rates will go into effect in February. The total annual reduction in fuel costs in 2016 is approximately $120 million. The requested decrease is being driven by the company’s ability to take advantage of lower fuel prices. The cost of fuel is a separate component of customers’ electricity bills. The recovery of fuel costs is allowed under Mississippi law and Mississippi Power does not earn a profit on fuel costs.